The current state of affairs may be considered progress by Dörnyei and colleagues (Dörnyei, 2005; Tseng, Dörnyei, & Schmitt, 2006), who have proposed replacing the concept of learning strategy with that of self-regulation and, in doing so, shifting the focus of research from specific learning behaviors to a trait seen to underlie them. But what exactly does self-regulation have to offer second language acquisition, and does it really necessitate this important change in research focus? In this paper I briefly highlight alternative conceptualizations of self-regulation and then illustrate one in particular to make the point that, depending on the model one adopts, self-regulation also has the potential to reinvigorate L2 strategy research and cast new light on its findings. Other views of self-regulation have been presented in recent L2 research (e.g., Bown, 2009; Goh, 2010; Lai & Gu, 2011; Lewis & Vialleton, 2011; Rose, 2010; Tsuda & Nakata, 2012) but because Dörnyei and colleagues have made the most explicit and formal argument for importing self-regulation as a construct from the field of educational psychology, and because this was accompanied by a controversial proposal regarding learning strategy research, theirs will be my focus. Dörnyei and colleagues are motivated by two main problems they have identified in the L2 learning strategy literature. First, the concept itself suffers from “definitional fuzziness” (Tseng et al., 2006, p. 95) insofar as it conceptualizes strategies as phenomena that can be behavioral, cognitive or affective in nature. Second, they level criticism at research instruments that have frequently been used to categorize and quantify strategy use, especially the SILL, or Strategy Inventory for Language Learning (Oxford, 1990, 2011). Because the rating scales used in the SILL are based on frequency of use, they “are not cumulative and computing mean scale scores is psychometrically not justifiable” (Dörnyei, 2005, p. 182). These authors also note that, as L2 strategy research has shown, there is no direct relationship between use of a particular strategy and success in learning. The same behavior may lead to achievement if applied by one learner to a certain task in a particular context, but not in other circumstances. From this they conclude that “the most important aspect of strategic learning is not the exact nature of the specific techniques that students employ but rather the fact that they choose to exert creative effort in trying to improve their own learning” (Tseng et al., 2006, p. 95). Citing Wolters (2003), Dörnyei notes that learning is fraught with potential obstacles that may interfere with learners’ performance, goals or motivation, and so those who can “maintain their motivation and keep themselves on-task in the face of competing demands and attractions should learn better than students who are less skilled at regulating their motivation” (Dörnyei, 2005, p. 91). Self-regulation is thus seen as the underlying capacity driving learners efforts “to search for and then apply personalized strategic learning mechanisms” (Tseng et al., 2006, p. 79). Its trait-based nature is said to be attested by the fact that certain learners are more effective at strategy use than others, hence the need for researchers to shift the focus from specific behaviors to this underlying capacity. To facilitate this new mode of inquiry, Tseng et al. (2006) developed an instrument addressing self-regulation through the use of action control strategies, which originate in volitional research from experimental psychology (Kuhl, 1987) and educational psychology (Corno & Kanfer, 1993). To increase construct validity, these strategies were situated in one particular domain, L2 vocabulary learning, because this aspect of second language acquisition requires sustained individual effort over time. The resulting construct, called Self-Regulating Capacity in Vocabulary Learning, or SRCvoc, consists of five facets: commitment control, metacognitive control, satiation control, emotion control, and environmental control, as shown in Figure 1. These facets, it should be noted, operate over the intention to learn rather than learning behaviors directly. The authors used confirmatory and exploratory factor analysis and data from secondary and tertiary EFL learners in Taiwan to show that the 20-item instrument had valid psychometric properties. They also proposed that their theoretical framework and approach to questionnaire development could be used to extend the concept of self-regulating capacity to other aspects of L2 learning. Figure 1. Hypothesized Model of Self-regulating Capacity in Vocabulary Learning, with Factor Loadings from Confirmatory Factor Analysis. From “A new approach to assessing strategic learning: The case of self-regulation in vocabulary acquisition,” by W. T. Tseng, Z. Dörnyei, and N. Schmitt, 2006, Applied Linguistics, 33(1), p. 93. Copyright by Oxford University Press. Reprinted with permission. Controversy over these developments seems to have arisen not so much from the construct of SRCvoc itself – which, insofar as it represents a new variable potentially mediating strategic behavior, is of obvious import – but because Dörnyei and colleagues proposed that self-regulating capacity might replace the concept of learning strategy in second language acquisition, as apparently happened in educational psychology, where the latter term “has virtually been abandoned for research purposes and has been maintained primarily for pedagogical discourse only” (Tseng et al., 2006, p. 80). How broad an impact this proposal is having is still unclear. SRCvoc has so far appeared in a modest number of published studies conducted in East Asian contexts. Rose (2010) adapted Tseng et al.’s instrument to investigate self-directed learning of Kanji among tertiary level L2 learners of Japanese. Mizumoto and Takeuchi (2012) also adapted the instrument for use in Japan, but with undergraduate learners of English, and found the scale to be valid, albeit with a different factor structure they attributed to cultural differences. In an application that might exemplify the controversy, Huang (2010) contrasted the effects of divergent and convergent assessment on motivation and strategy use among Taiwanese university learners of English, with strategy use measured via the SRCvoc instrument. In published critiques of Tseng et al. (2006), some researchers have argued that self-regulation and learning strategies may simply represent different approaches to studying the same phenomena, and may suffer from similar weaknesses. Gao (2007) suggests there is considerable overlap between self-regulating capacity and metacognition as discussed in the work of Wenden (1998, 2002). Rose (2012) makes a similar point and notes that, in his doctoral research, action control strategies themselves exhibited definitional fuzziness. Such critiques have merit, but to the extent they assume Dörnyei and colleagues’ version of self-regulation to be the only valid formulation, they miss opportunities to widen the theoretical lens and explore what else this construct may have to offer our field. In the last three decades, self-regulation has emerged as a central concept in psychology, as researchers tried to integrate cognitive, affective, motivational and behavioral components into theories that explain how individuals adjust their actions and goals to achieve desired ends under variable conditions (Zeidner, Boekaerts, & Pintrich, 2000). The field is now represented by a large literature comprising many models. Table 1 shows the major theories of self-regulated learning (SRL), along with strengths and controversies associated with each, as discussed by Zimmerman and Schunk (2001). According to Zimmerman and Schunk, all theories of self-regulation can be used to explain success in learning, but each focuses on different aspects of how it is achieved. Operant theories highlight the importance of delayed gratification and how this can be enhanced by “reinforcers” such as praise. Phenomenological theories deal with self-perceived identities that can be academic (e.g., scholar or athlete) or non-academic (e.g., slacker or jock) in nature, and how these identities influence perceptions of tasks, goals, and methods of learning. Information processing theories describe self-regulation in terms of feedback loops, in which learners are engaged in self-monitoring, evaluation vis-à-vis standards, and adaptations made on the basis of that monitoring and evaluation. Social cognitive theories emphasize the role of situational task contexts on different types of goals (e.g., task-specific versus general, or proximal versus distal in time), as well as self-efficacy beliefs, i.e., the expectancies learners have regarding their abilities to perform specific tasks. Volitional theories focus on learners’ struggles to initiate or maintain good learning habits in the face of distractions or setbacks. Vygotskian theories construe self-regulation in terms of the verbalization or self-directed speech learners use when working under challenging conditions, such as a first grader spelling a new word aloud. Finally, constructivist theories address learners’ cognitive processes as they construct strategies and theories needed to master academic tasks, or their engagement in co-construction of effective modes of academic performance as part of learning communities. Zimmerman and Schunk say each theory’s impact has been attenuated by controversies arising from issues of definition, measurement, validation, or implementation in practice. For example, some researchers question whether rewards initiated and controlled by learners themselves truly represent reinforcement as defined in operant theory. Critics of social cognitive theory have suggested self-efficacy does not actually reflect motivational beliefs but simply learners’ reporting of subsequent behavior. Information processing theory has yet to adequately explain “positive feedback loops,” i.e., the way reductions in discrepancies between performance and standards can push learners to set new, more challenging goals. With Vygotskian and constructivist conceptualizations, controversies have arisen from diverging views about how to conduct interventions based on the theory or variants of the theory. Phenomenological theory is hampered by problems in defining self-identities, while volitional theory is said to lack empirical support from research validating volition as a phenomenon distinct from more established motivational constructs. Despite such controversies, a model of self-regulation based in any one of these theories might provide insights into the process of second language acquisition in general and L2 vocabulary learning in particular. It makes sense that Dörnyei and colleagues chose a volitional perspective given Dörnyei’s invaluable contributions to L2 motivation theory. A problem arises, however, when we consider their characterization of SRCvoc as a trait underlying strategy use in light of Zimmerman and Schunk’s discussion of another controversy in self-regulation theory, that of psychophysical dualism. Citing Misiak and Sexton (1966), Zimmerman and Schunk describe psychophysical dualism as referring to “theories that assume human nature is composed of two different and mutually irreducible elements: a mind and body” (2001, p. 301). Dualistic models of self-regulation are said to be based on Platonic- or Cartesian-style conflicts between this inner, rational mind and an outer, physical body that must operate in environments where it is susceptible to boredom, discomfort, distractions, etc. Writing more than a decade ago, Zimmerman and Schunk said the field had largely moved on from such models, which depict self-regulation as an “autonomous inner state,” to now defining it in terms of “skillfully orchestrating processes that are at once covert, behavioral, and environmental” (Zimmerman & Schunk, 2001, p. 304). Thus, while these theorists would all agree that self-regulation is concerned with personal initiative, perseverance, and creative effort in improving one’s learning, they are seen to diverge with respect to two key attributes: the level at which self-regulation operates, i.e., a trait versus an event, and the related issue of adaptiveness. This will be obvious in the following sections, in which I contrast SRCvoc with a model derived from information processing theory that exemplifies the concept of a feedback loop. My point is not to argue the superiority of information processing models but to say that theories stand or fall according to how well they allow us to explain and predict phenomena of interest and inform our practice. If Dörnyei and colleagues are proposing that we deemphasize learners’ specific behaviors in favor of a volitional, trait-based view of self-regulation, we must ask how much overlap exists between this new paradigm and longstanding concerns of L2 strategy researchers, such as the relationship between strategic behavior and achievement. I will show how a process model of self-regulation, when applied in my doctoral research, not only provided an explanation for variation in strategic performance but also unique insights into differential achievement that would not have been possible using a trait-based model. In my study, I used the COPES model of self-regulated learning proposed by Winne and Hadwin (1998). As illustrated in Figure 2, this is a process model that conceptualizes self-regulation as an event and can thus facilitate dynamic descriptions of the interplay of cognitive, motivational and behavioral phenomena. Furthermore, being based in information processing theory, it also takes account of the effects of processing limitations and limited working memory capacity on this interplay. Figure 2. The COPES Model of Self-regulated Learning. From “Studying as self-regulated learning,” P. H. Winne and A. F. Hadwin, 1998, p. 282. In D. J. Hacker, J. Dunlosky & A. C. Graesser (Eds. ), Metacognition in educational theory and practice. (pp. 277-304): Mahwah, NJ, US: Lawrence Erlbaum Associates. Copyright by Taylor & Francis Group LLC. Reprinted with permission. A feature which distinguishes it from many other SRL models is a stage at the beginning called task definition, in which learners form internal and potentially idiosyncratic mental representations of tasks. This stage is in addition to the subsequent and more commonly recognized stages of goal setting and planning, enacting strategies and tactics, and adaptation. COPES stands for conditions, operations, products, evaluations, and standards. With the exception of operations, each of these components represents a type of information generated or used by the learner during a learning event (Greene & Azevedo, 2007). Conditions are the resources available for, and any constraints that might operate over, completion of a task, and consist of two types. Task conditions are external to the learner and might include resources, cues embedded in tasks by a teacher or designer, and time, as well as features of the social context, such as a requirement to work in small groups. Cognitive conditions are internal to the learner and include beliefs about learning, motivational influences (e.g., goal orientation and self-efficacy judgments), domain knowledge, task knowledge, and knowledge of tactics or strategies. Conditions influence both operations and the standards learners adopt in goal setting and planning. Standards consist of a “multivariate profile of attributes” (Winne & Hadwin, 1998, p. 281) generated as a product of task definition and refined during goal setting and planning. Standards define the optimal end state of the current phase in operation and can include both beliefs and metrics. In Figure 2, standards are represented as a bar graph with five different scales, which might incorporate a mental representation of the completed task product, as well as beliefs about how long completion of the task should take, the level of understanding to be achieved, etc. Operations are cognitive processes enacted in working memory that transform information. They include innate processes that are “primitive” in the sense of not allowing further decomposition into subprocesses (such as searching, monitoring, and rehearsing), as well as acquired processes that are more complex, i.e., strategies. Operations occur in each phase of the model and lead to products, which are then compared to standards through monitoring. This monitoring, which occurs in each phase of the cycle, is “the pivot on which SRL turns” (Winne, 2001, p. 164). Comparing phase products to standards in turn generates further products in the form of evaluations. If an evaluation indicates discrepancies between products and standards, metacognitive control might be enacted over operations to redefine the task, manipulate conditions, revise goals and standards, refine the products, or possibly abandon the task altogether. In this way, products in any stage can lead to updates in any other, and so the model is a “recursive, weakly sequenced system” (Winne & Hadwin, 1998, p. 281). Adaptation is the final and only optional stage of the model and is characterized by an overall metacognitive evaluation of the products of learning, in which learners may decide whether or not to update motivation, beliefs, standards, or strategies. It is thus where major self-regulatory developments occur. In a review of contemporary educational research, Greene and Azevedo (2007) showed how the COPES model could provide new perspectives on recent findings, particularly due to its more complex cognitive architecture as compared with other SRL models. I will now illustrate how it can also be applied in the domain of L2 vocabulary learning, contrasting its explanatory power with the conceptualization of self-regulation proposed by Dörnyei and colleagues. The main purpose of my study was evaluation of an automated, online resource for strategy instruction (Ranalli, forthcoming) designed to teach tertiary-level ESL learners an integrated form of dictionary skills and language awareness of features of “word combinability,” i.e., transitivity, complementation and grammatical collocation (see discussion in Lew, 2011). Specifically, the goal was to teach students how to use learner’s dictionaries to identify and correct errors such as Traffic jams result of (from) having too many cars, which appear to be common in ESL and EFL college student writing (Chan, 2010; Hemchua & Schmitt, 2006). The evaluation was based on an experiment contrasting an explicit strategy instruction condition with a comparison condition that involved learners in repeated dictionary consultations for usage information but no instruction. Both conditions were administered online through a learning management system, in which 64 participants were assigned randomly to the treatment and comparison groups after being matched for vocabulary size. I developed a task-based measure of strategic ability to resemble the type of editing a learner might do on a piece of academic writing, and this was administered as a pre- and post-test. In addition to evaluation of the strategy instruction, the study also addressed the issue of monitoring accuracy, i.e., the extent to which metacognitive evaluation of performance (referred to as confidence) corresponds to actual performance. In the COPES model, it will be recalled, monitoring potentially influences the outcome of each stage, so the products of monitoring will need to be reasonably accurate to facilitate self-regulation. Confidence was measured by having the participants estimate their scores immediately after completing the pre- and post-tests, and then the confidence and performance scores were compared. Following the experiment, a multiple case study was conducted of discrepant cases, i.e., participants whose performance had diverged significantly from group norms and which thus merited further investigation. Two cases were of particular interest: Paul, an African man in the strategy instruction group, who had only a few years of formal study of English but considerable language learning experience in naturalistic settings, and who had immigrated to the US three years earlier; and Eunhee, a Korean woman in the comparison group who had studied English for many years in school but had had few opportunities to use it for authentic spoken communication, and who was a new exchange student. As part of the instrument battery, all participants were given a version of the SRCvoc questionnaire presented in Tseng et al. (2006), which had been adapted for use in a tertiary-level ESL environment. The results for Eunhee and Paul, along with means and standard errors for the entire sample, are illustrated in Figure 3. We see that on each scale, Paul reported higher levels of volitional control compared to Eunhee and to the means for the sample. These self-reports aligned with interview data and responses on a separate motivation questionnaire showing Paul to be an eager and confident language learner, buoyed by his experience acquiring a number of African languages informally and learning French at school. By comparison, Eunhee’s self-ratings were generally low in relation to the group averages, which corresponded to interview and questionnaire data showing her to be critical of her own language learning efforts and lacking confidence in her use of English with native speakers, despite overall high motivation to learn and a strong mastery goal orientation. Thus, in Dörnyei and colleagues’ terms, we might expect Paul to be the more “strategic” – and thus successful – of the two. Confidence and performance measures painted a different picture, however. The post-test data in Figure 4 show Eunhee to have outperformed the rest of the sample, with both a perfect score and perfect monitoring accuracy, despite not receiving the strategy instruction. Paul, while a member of the treatment group, had a mean score closer in line with the comparison group average, and while most of his groupmates showed considerable improvement in monitoring at post-test, Paul’s confidence scores remained wide of the mark, as indicated by the vertical distance from the identity line (representing perfect monitoring accuracy). To be specific, he thought he had done more than twice as well on the measure than he actually had. Such extreme overconfidence is associated with a lack of general or domain-specific knowledge (Nietfeld, Cao, & Jason, 2005). My COPES-based analysis, which also incorporated thinkaloud data, showed that Paul’s problems arose from shortfalls in cognitive conditions. His domain knowledge in terms of receptive vocabulary and syntactic processing skills were low compared to most of his classmates, such that much of his attention was devoted to decoding words and phrases in the task prompts. He also demonstrated an idiosyncratic, meaning-oriented approach to judging grammaticality and a high tolerance of ambiguity, probably as a result of his primarily naturalistic experiences of language learning and his status as a multilingual (see Dewaele & Wei, 2013), which rendered him unable to recognize all but the most obvious lexical usage errors. Despite his undiminished confidence and eagerness to learn, he seemed poorly positioned to self-regulate his way into actual improvement with the skills in question without considerable individualized remediation. By contrast, Eunhee was able to excel in the absence of strategy instruction because she had so many cognitive conditions working in her favor: a much larger vocabulary size compared to the sample average, highly developed syntactic parsing skills as a result of years of exam-oriented English instruction, familiarity with learner’s dictionaries, more advanced reading skills and, importantly, a recently adopted goal to learn to “use words correctly” in her interactions with native speakers. She was thus able to bootstrap her way into mastery of the new skills in question, beyond the level reached by any member of the strategy instruction group. The major insights here derive from the COPES model’s inclusion of a stage for task definition. Paul’s inadequate cognitive conditions impaired his ability to form a reasonably accurate internal model of the task, which in turn undermined his selection of appropriate strategies to address it, and left him with insufficient processing capacity and evaluative criteria for monitoring. Eunhee’s abundance of facilitative cognitive conditions allowed her to define the task with a high degree of accuracy, adopt goals consistent with it, identify appropriate strategies to address it, and accurately monitor their implementation. Indeed, the as yet poorly understood process of task definition on the part of the learner may be a key to understanding why the same strategic behavior leads to success in one situation and failure in another, which is why some L2 strategy theorists have identified it as a research priority (Rubin, 2005; Wenden, 2002). This is not to say Eunhee was therefore the more strategic vocabulary learner in general. Her comparatively rigid, highly form-focused approach may well have hindered development of strategies requiring fluent and creative use of the lexicon, as opposed to Paul’s much more flexible and meaning-oriented one. With respect to this particular task and context, however, her abilities and choices led to success, despite her lower self-reported volitional control. Thus, in this illustration at least, an integrative, process-oriented view of self-regulation surpasses a volitional, trait-based view in explaining strategic behavior and variation in achievement, which, I assert, are among the chief concerns of L2 strategy researchers. To return to the main question of this paper: what does self-regulation have to offer second language acquisition? Dörnyei and colleagues have proposed a volitional, trait-based model, which they position as a necessary antecedent to the creative search for and use of individualized learning mechanisms, and which they suggest could allow us to circumvent the problematic study of such mechanisms themselves. My counter argument is that such a model will be insufficient for explaining phenomena of primary interest to L2 strategy researchers, in contrast to models that view self-regulation as an adaptive process and allow learners’ specific strategic choices, as well as other important individual-difference factors, to be contextualized and related to each other. A full account of my study was beyond the scope of this paper, but the L2 strategy literature already contains evidence to support the argument presented here. For example, Vann and Abraham (1990) showed in their case studies that unsuccessful learners were far from unmotivated, putting what could be called creative effort into selection and coordination of strategies for addressing a variety of L2 tasks. Their problems arose from mismatches between their selected strategies and task demands. The researchers speculated about the roles of processing limitations, lack of domain knowledge, and counterproductive language learning beliefs. It is informative to review such studies from the perspective of adaptive, process-oriented models of self-regulated learning and consider the extent to which they may help us to better understand and integrate previous strategy and motivation research. Despite legitimate concerns about definition and measurement, L2 researchers are unlikely to abandon interest in specific learning behaviors any time soon, because they are the raw material of learner agency and a key to understanding achievement, or the lack thereof. Some may consider strategy research at present to be a dark corner of L2 studies, if not a dead end, but rather than switching our focus elsewhere because the light is better, we should find new ways to illuminate the problems that actually drive the field. In this paper, I have tried to show the potential of alternative views of self-regulation for this purpose. Jim Ranalli is a postdoctoral research associate in the TESL/Applied Linguistics Program at Iowa State University. His research addresses the intersection of L2 vocabulary, technology, and self-regulated learning. His work has appeared in Language Learning & Technology, CALICO Journal, and Computer Assisted Language Learning. 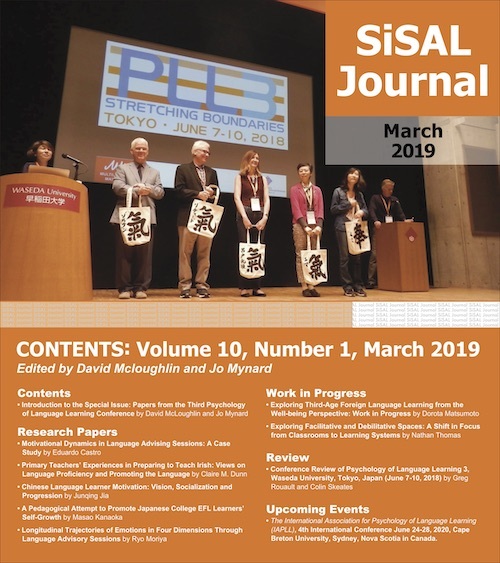 My sincere thanks go to Heath Rose for the invitation to contribute to this special issue of SiSAL Journal, as well as to Carol Chapelle and the two anonymous reviewers for their helpful comments on an earlier draft of this paper. Goh, C. C. H. (2010). Listening as process: Listening materials for self-appraisal and self-regulation. In N. Harwood (Ed. ), English language teaching materials: Theory and practice (pp. 179-206). Cambridge, UK: Cambridge University Press. Hemchua, S., & Schmitt, N. (2006). An analysis of lexical errors in the English compositions of Thai learners. Prospect, 21(3), 3-25. Kuhl, J. (1987). Action control: The maintenance of motivational states. In F. Halish & J. Kuhl (Eds. ), Motivation, intention, and volition (pp. 279-291). Berlin, Germany: Springer. Misiak, H., & Sexton, V. S. (1966). The history of psychology: An overview. New York, NY: Grune & Stratton. Nietfeld, J. L., Cao, L., & Jason, W. O. (2005). Metacognitive monitoring accuracy and student performance in the postsecondary classroom. The Journal of Experimental Education, 74(1), 7-28. Oxford, R. L. (2011). Teaching and researching language learning strategies. Harlow, UK: Pearson Longman. Ranalli, J. (forthcoming). Online strategy instruction for vocabulary depth of knowledge and web-based dictionary skills. Language Learning & Technology. Rubin, J. (2005). The expert language learner: A review of good language learner studies and learner strategies. In K. Johnson (Ed. ), Expertise in second language learning and teaching (pp. 37-63). New York, NY: Palgrave Macmillan. Winne, P. H. (2001). Self-regulated learning viewed from models of information processing. In B. J. Zimmerman & D. H. Schunk (Eds. ), Self-regulated learning and academic achievement (pp. 153-190). Mahwah, NJ: Lawrence Erlbaum Associates. Winne, P. H., & Hadwin, A. F. (1998). Studying as self-regulated learning. In D. J. Hacker, J. Dunlosky & A. C. Graesser (Eds. ), Metacognition in educational theory and practice. (pp. 277-304): Mahwah, NJ: Lawrence Erlbaum Associates. Zeidner, M., Boekaerts, M., & Pintrich, P. R. (2000). Self-regulation: Directions and challenges for future research. In M. Boekaerts, P. R. Pintrich & M. Zeidner (Eds. ), Handbook of self-regulation. San Diego, CA: Academic Press. Zimmerman, B. J., & Schunk, D. H. (2001). Reflections on theories of self-regulated learning and academic achievement. In B. J. Zimmerman & D. H. Schunk (Eds. ), Self-regulated learning and academic achievement (pp. 289-308). Mahwah, NJ: Lawrence Erlbaum Associates. This is not to say, however, that educational researchers have abandoned interest in strategic behavior and its relationship to achievement, as Dornyei and colleagues would certainly agree. A mastery goal orientation, according to Ames (1992), focuses on the intrinsic value of learning, in contrast to a performance goal orientation, which defines success normatively, e.g., in terms of surpassing others.